I have had an awful spring cold this week. At first I was tempted to think it was allergies. But, no, this is more than that. Achy body. Coughing. Drainage. I spent an entire day in bed, just popping out long enough to feed my family and fold laundry. It was rotten. The girls are both joining me in the misery. We are unified in coughing and blowing and going to bed early. Other than that, it has been a wonderful spring week. My cherry tree blossomed. And I've been enjoying the fresh and and glorious sunshine through my open bedroom window. On the business front, I have had an amazing month! I picked up about 550 subscribers via the Ultimate Bundle. These were all comped subscriptions, but it is still great for getting the word out. Plus, I made more money on subscriptions than any month yet. Which is awesome. It's paying for babysitters, and lunch, and leaving something left over. Pretty cool. I've invested a lot of time and money into She Plans Dinner over the past 15 months. It is great to see it taking off. Btw, there might just be a Mother's Day sale in the works for next week. I've heard something about BOGO... I love being the boss, and being able to set my own sales. Seriously?! Who doesn't love sales?! Anyway. Today's recipe. It's one of those recipes that I saw, and knew it was going to be amazing. How couldn't it be? 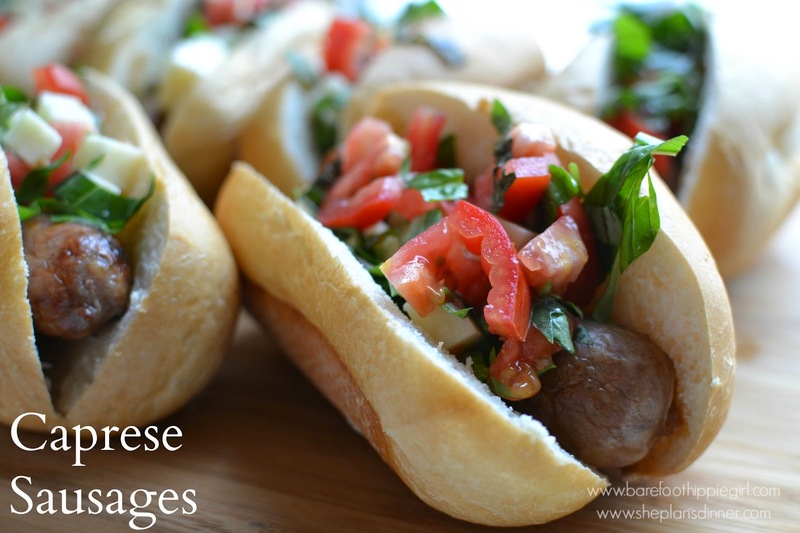 Grilled sausages on chewy hoagie buns? Topped with fresh tomatoes, mozzarella cheese and basil? Simple and delicious! Perfect for summer grilling. And for spring. And for every time in between. -Chop the roma tomatoes. Dice the mozzarella cheese. Chop the basil. 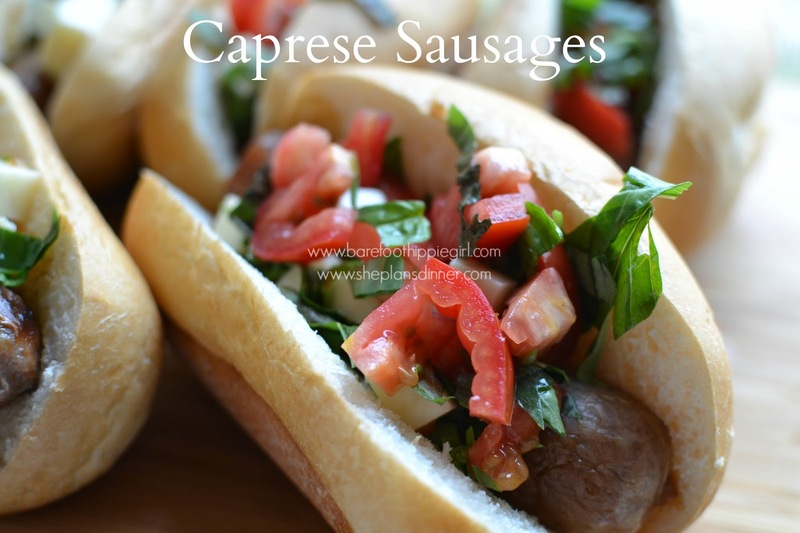 -Drizzle each sausage with a little oil and vinegar. Top with the tomatoes, basil and cheese.